This is another one of those awesome times when all it takes is for me to see a sign that says: “Free Wi-Fi” and I pretty much get an idea. Well kind of, all I wrote down in my notebook was “Free Wi-Fi” and later on I worked on the idea in my head. 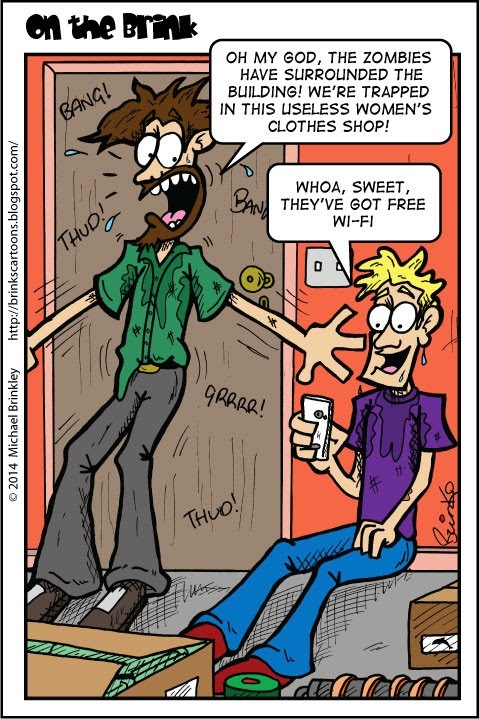 I started thinking about how much people love free wi-fi, as there’s always people out the front of my local Apple shop sponging it, and I wondered what it would take to not be excited about it. Maybe nothing, it’s all a mater of perspective. Originally I had these two guys stuck on a tiny deserted island, one guy looked depressed and the other excited as he found free wi-fi. I kind of liked the idea that it wasn’t really possible and rather silly, but later on I came up with this zombie idea, that kind of makes more sense. That and drawing 2 guys on a tiny island is kind of boring and I ended up liking this more anyway so I went with it.